Follow the instructions to get to the Papagayo beaches. Park at Playa Mujeres. From there, walk over the cliff on the left and then down to this beach, or through the rocks al low tide, passing by two small coves. 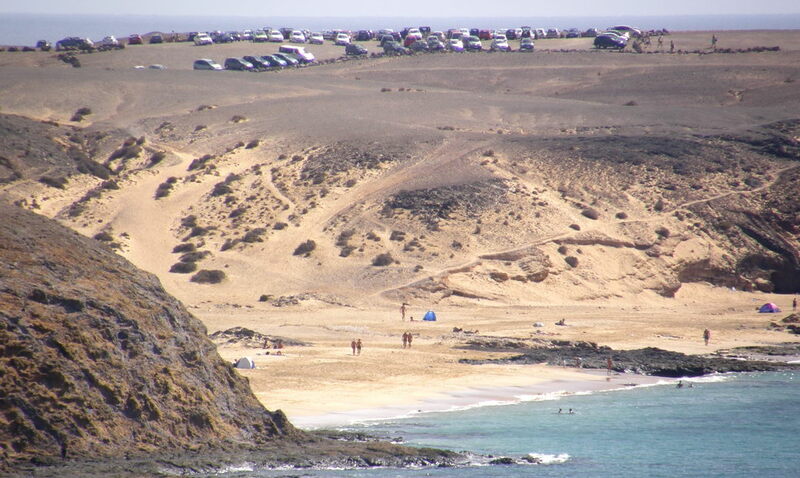 From the parking lot close to Papagayo beach, follow the paths on your right. This way is shorter, but it is easy chosing the wrong path and having to go back (don't worry, it is impossible to get lost). It is the second of the Papagayo beaches, and one of the largest ones. It is never crowded, since it is quite far from any of the existing parking lots. There is a rock in the middle of the beach that almost divide it into two halfs. On the right, an area with golden sand and very few rocks. Most people like this part, because next to the cliff you can be protected from the wind and swimming is quite easy. On the left, there are more rocks scattered in the sand, particularly a kind of barrier that makes difficult going into the sea. The view is wonderful. In front of you, the small Lobos island and the coast of Corralejo and the volcanos in Fuerteventura. At your back a gentle slope that leads to the volcanos in Lanzarote. You can usually find yatchs and small boats anchored in front of the beach. The main drawback is the wind and the lack of any shade. The sea, on the contrary, is calm and incredibly clean. I love the 'live and let live' attitude that dominates the beach. It seems that the people that come here try not to modify the environment. Very few umbrellas or tents, much less sunbeds, maybe beause of the distance to the parking lot. Most people carry only the essentials for a day on the beach. It invites visitors to relax. Usually considered nudist, wearing clothes or not is the same here. It is true that most nudist concentrate on both sides and textiles in the center, but you can walk as you like all along the shore, and even reach other coves.